Frostburg State University’s Department of Music will present its Evening of Jazz on Tuesday, Dec. 4, at 7:30 p.m. in the Pealer Recital Hall of FSU’s Woodward D. Pealer Performing Arts Center. The program will feature the FSU Jazz Orchestra as well as Vocal Jazz Ensemble. 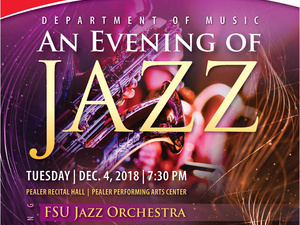 The program will open with the FSU Jazz Orchestra, led by director Dr. Brent Weber, and will feature “In the Mood” as performed by the Glenn Miller Orchestra; “Intersecting Lines” by Les Hooper; “Hay Burner” by Count Basie; “The Way You Look Tonight” by Jerome Kern, arranged by Mike Tomaro; and “My Funny Valentine” as performed by the Sten Kenton Orchestra. Under the direction of Scott Rieker and accompanied by pianist Dr. Joseph Yungen, the FSU Vocal Jazz Ensemble will perform “Spain” by Chick Corea; “Warm-Up” from “Mass” by Leonard Bernstein; “Raggy Waltz” by Dave Brubeck, arranged by Luigi Zaninelli; “I’m All Over It Now” by Jamie Cullum, arranged by Rieker; “Blackberry Winter” by Alec Wilder and Loonis McGlohon, arranged by Dave Cross; “Carol of the Bells,” arranged by Pentatonix; and “Angels Are Singing” by Michael McGlynn. “In the Mood” is based on an old jazz riff that had been passed around for a few years in various forms. Miller, a gifted editor, was able to pare the tune down to its essentials. The famous introduction featuring the saxophones in unison, the catchy riff that anchors the tune and the suspense-building ending are all ingredients of the classic Miller sound. “Intersecting Lines” is a very fresh-sounding piece with lots of counterpoint and counter rhythms. “Hay Burner” starts out with a “hopping” two-beat feel, then goes to a four-beat feel. The spacing of the different sections allows each one to be heard separately and still come together to create a cool sound. “The Way You Look Tonight” was introduced in the film “Swing Time,” when Fred Astaire (Lucky) sings it to Ginger Rogers (Penny). The original Rodgers and Hart number, “My Funny Valentine,” was sung by a female lead, fondly listing the faults of the male lead. But deeper feelings are revealed when the rhythm kicks in. “Warm-Up” is from “Mass,” staged as a traditional Catholic Mass, with the main singer occupying the role of a Catholic priest. Yet over the course of the work, doubt creeps into the ritual, both musically and textually, and the structure of the Mass completely falls apart and disintegrates as the celebrant comes to terms with his own crumbling faith and moral emptiness. “Raggy Waltz,” which debuted in 1961 on the album “Time Further Out,” isn’t exactly a waltz or a rag but a choppy piece with constantly shifting accents that don’t predictably fall where the listener expects. Cullum has said that he wrote “I’m All Over It Now” as a short, snappy pop song in the style of ’70s Elton John. It’s a break-up song about feeling heartbroken, then having that moment where the switch flips and you realize you’re fine. Blackberry Winter is an American term used in the South and Midwest to describe a short, unexpected cold snap that can come in after the first few warm days of spring when blackberries are in bloom (and can refer to warm love having a cold snap). The American self-taught composer Wilder wrote about love lost in “Blackberry Winter,” one of his popular songs. “Carol of the Bells” is a popular Christmas carol, written by Ukrainian composer Mykola Leontovych in 1914. Pentatonix covered the song on their album “PTXmas,” one of the bestselling Christmas albums of 2013. Admission is $10 for adults; $5 for seniors, members of the military and FSU faculty and staff; $3 for students; and free for children 12 and younger. Tickets are available at the door. Cash and credit cards are accepted.